LAKELAND -- Lace up your shoes and get ready to run - or walk - for faith and fitness at the inaugural Florida Annual Conference 5K. Proceeds from the event will benefit Imagine No Malaria, a worldwide campaign to eradicate malaria. Funds will help pay for education, protective mosquito nets and other treatments for this parasitic disease. The Florida Conference recently agreed to a formal partnership with the United Methodist effort that has helped cut malaria deaths nearly in half in recent years. Details of the partnership will be announced at the 2014 Annual Conference. About 200 people are expected to sign up for this first-ever conference 5K, which will start at 6:30 a.m. June 12 at Lake Hollingsworth. The event is open to the public. "We really encourage the greater Lakeland community to join us," says Rev. Sarah Miller, pastor of Reeves UMC, Orlando. The run-walk kicks off the second day of planned activities for the 172nd session of the Florida Annual Conference, scheduled for June 11-14 at The Lakeland Center, 701 Lime St.
Advance registration for the 5K is $25 through June 11, but a race T-shirt is guaranteed only if registration is completed by June 5. On the day of the run, registration is $35. The 3.1-mile course will begin at the corner of Ingraham Avenue and Lake Hollingsworth Drive. 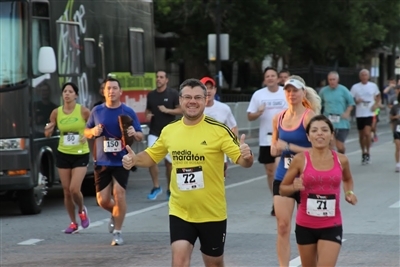 Participants can pick up their pre-race packets from noon to 6 p.m. June 11 at The Lakeland Center or beginning at 5:30 a.m. on race day. To register, visit www.flumc.org/5K. Miller says the race and the charity it benefits fit neatly into the theme of this year's conference: "The Mission of God." Race participants are expected to represent about 10 percent of the anticipated 2,000 Methodists who attend the conference, she says. Runners from Reeves UMC, Orlando, work out for a good cause at the church's first 5K Run last fall. Photo from Rev. Sarah Miller. "This is an active way that members of the annual conference can unite faith with fitness as an expression of their activism," Miller says. "It really is a way we can take care of ourselves so we can commit to taking care of and serving others." Social media got the 5K started. Rev. Jad Denmark, minister of connection at St. Luke's UMC, Orlando, tweeted a query at last year's annual conference. He wondered why the Western North Carolina Conference sponsored a 5K while Florida's did not. His tweet was seen by Florida Bishop Ken Carter, who was a pastor and district superintendent in Western North Carolina before being elected bishop and taking office in Florida in 2012. The upshot? Miller and Denmark were tapped to form a committee and organize this year's inaugural race. Miller is something of an old hand at the task, after staging a 5K run in 2013 at her church. For beginners who have never run the distance of a 5K, Miller recommends adopting a training program. About 10 weeks remain until race day, and at least one online source, Cool Running, offers a "Couch to 5K" training program designed for eight weeks out. Its creator, Josh Clark, designed the program as a way to get fit in the most painless way possible. It follows a thrice-weekly schedule of brisk warm-up walks, followed by alternating periods of jogging and walking to build endurance. A beginner's training schedule can be found at www.coolrunning.com. There also are training tips and schedules for more seasoned runners. Miller recommends buddying up with a friend or forming a fitness group as a great way to have fun and improve overall health. “I'm not a runner, but I am an active person," she says. "I definitely believe in an active lifestyle, and I'm committed to finding a way to bring our clergy into an active life." Recent studies have identified clergy as among the most overworked people in the U.S. In 2002, about 76 percent were overweight or obese, compared with 61 percent of the general population. In 2007, the Duke (University) Endowment provided a $12 million grant to North Carolina’s Duke Divinity School to establish the Clergy Health Initiative, aimed at assessing and changing poor health habits among United Methodist clergy in the North Carolina and Western North Carolina conferences. The initiative recommends that clergy members consider their physical condition in deciding whether to participate in new forms of exercise. For information about the Florida Conference 5K, email Sarah.Miller@flumc.org. Kathy Steele is a freelance writer based in Tampa.